ST. LOUIS (CNS) — Father McDonald Nah is praying that the people of Liberia are just as resilient with the Ebola outbreak as they were following the country’s civil war more than a decade ago. 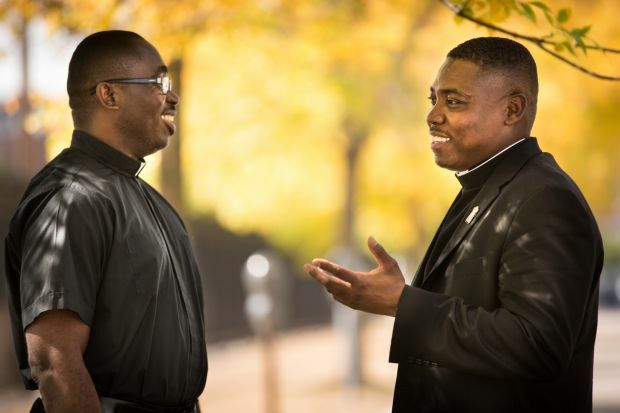 Father Nah is a priest of the Archdiocese of Monrovia, Liberia, who is currently studying Catholic education administration at St. Louis University. The priest, who resides at a downtown parish, St. Nicholas, with another Liberian priest, Father Urey Patrick Mark, is expected to return to Liberia next summer after he completes his studies. Father Nah said that people in Liberia have been isolated because of the severity of the virus, especially those who have been in close proximity to someone who has died from the illness. A priest for 11 years, Father Nah has served in two Liberian parishes, Sacred Heart Cathedral in Monrovia and St. Peter Claver Church. The people of those communities have become like family to him. He personally knows 16 people who have died from the Ebola virus. Earlier this year, Father Mark, a member of the Society of the Divine Word, was asked by his community to serve on a new mission team in the Diocese of Cape Palmas, Liberia. However, plans have been put on hold as the situation evolves. He is expected to head to the Divine Word motherhouse in Techny, Illinois, in November. Traditionally, families prepare a loved one’s body for burial themselves, but the government has mandated that all bodies be cremated. Father Mark, who started a collection of supplies to be sent to the church in Liberia, said he’s thankful for the U.S. government and others who have stepped in to help “restore humanity” in his country. To date the U.S. government has committed more than $175 million toward the effort to thwart the Ebola epidemic. The U.S. recently announced it will deploy 3,000 troops to help transport medical equipment, supplies and personnel. Catholic Relief Services, the U.S. bishops’ overseas relief and development agency, has increased its support in affected countries and has allocated more than $376,000 toward efforts such as training volunteers and religious leaders, providing hygiene kits and making household visits in Guinea, Liberia, Sierra Leone and Ghana. Brinker is a staff writer for the St. Louis Review and Catholic St. Louis, the newspaper and magazine, respectively, of the St. Louis Archdiocese.